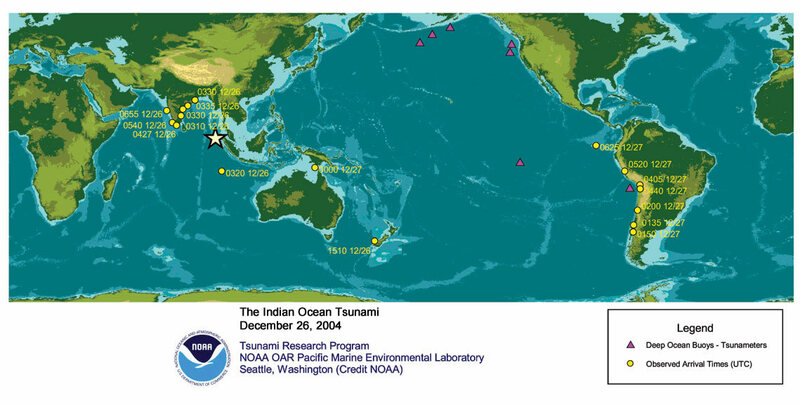 The Indian Ocean tsunami was generated by a Mw 9.1 earthquake (3.295°N 95.982°E), 2004-12-26 00:58:53 UTC, off the west coast of northern Sumatra (according to the USGS). Forecast results shown below were created with the NOAA forecast method using MOST model with the tsunami source inferred from tsunameter/DART® data. The graphics display research forecast results, showing qualitative and quantitative information about the tsunami, including tsunami wave interaction with ocean floor bathymetric features, and neighboring coastlines. 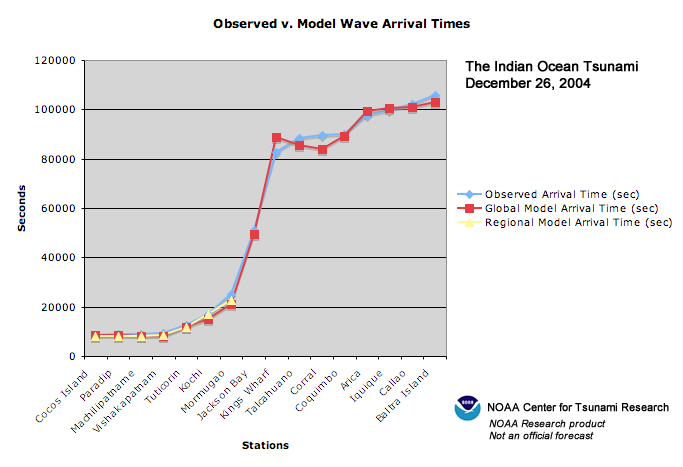 Tsunami model amplitude information is shown color-coded according to the scale bar. See information on MOST model. The altimetry data is courtesy of Remko Scharroo (Remko.Scharroo@noaa.gov) and Water Smith (walter.hf.smith@noaa.gov), NOAA, Laboratory for Satellite Altimetry, Silver Spring, MD, USA. Satellite Altimetry Database System at the Department of Earth Observation and Space (DEOS) Systems of the Faculty of Aerospace Engineering at Delft University of Technology, the Netherlands. DART (Deep-Ocean Assessment and Reporting of Tsunamis) - Buoys for early detection and real-time reporting of tsunamis in the open ocean. Arcas, D., and V. Titov (2006): Sumatra tsunami: lessons from modeling. Surv. Geophys., 27(6), doi: 10.1007/s10712-006-9, 679–705. Geist, E.L., V.V. Titov, D. Arcas, F.F. Pollitz, and S.L. Bilek (2007): Implications of the 26 December 2004 Sumatra–Andaman Earthquake on tsunami forecast and assessment models for great subduction-zone earthquakes. Bull. Seis, 97(1A), doi: 10.1785/0120050619, S249–S270. Geist, E.L., S.L. Bilek, D. Arcas, and V.V. Titov (2006): Differences in tsunami generation between the December 26, 2004 and March 28, 2005 Sumatra earthquakes. Earth Planets Space, 58(2), 185–193. Geist, E.L., V.V. Titov, and C.E. Synolakis (2006): Tsunami: Wave of change. Scientific American, 294(1), 56–63. Text of article from the Scientific American website. Rabinovich, A.B., P.L. Woodworth, and V.V. Titov (2011): Deep-sea observations and modeling of the 2004 Sumatra tsunami in Drake Passage. Geophys. Res. Lett., 38, L16604, doi: 10.1029/2011GL048305. Synolakis, C.E., and E.N. Bernard (2006): Tsunami science before and beyond Boxing Day 2004. Phil. Trans. Roy. Soc. Lon. A, 364(1845), doi: 10.1098/rsta.2006.1824, 2231–2265. Disclaimer: The forecasts on these pages show the results of ongoing research to enhance tsunami science and to improve NOAA operational tsunami forecasts. These products were developed during or shortly after the tsunami event, are intended for research use, and are not an official forecast. They should not be used as the basis of any public or private policy decisions. Please contact NCTR to find if there are more detailed follow-on analysis results.